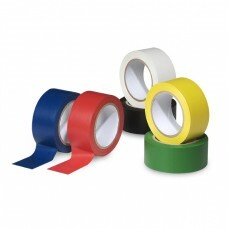 Floor marking tapes are made of several different materials, including PVC and vinyl. These tapes are typically coated with an aggressive, acrylic adhesive lasting 7 years or more. 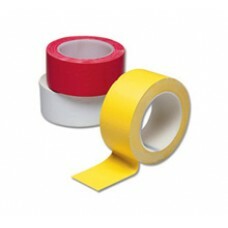 Floor marking tapes are useful in helping workers to identify the correct places to store materials and equipment. An example is creating distinctions between finished goods, raw goods, to-be-repaired goods, and equipment to ensure that productivity and safety are maximized while reducing the risk of mistakes. Floor Marking Tapes are an effective replacement for paints as they have a faster and easier installation and replacement process, which can dramatically reduce down times. Floor marking tapes are scuff and break resistant as well, unlike paints that might chip and scratch off. Lastly, tapes are much easier to store and transport and also have much higher shelf lives.